If Superman could have a superdog in Krypto, Batman could have a Bat-Hound in Ace. If Superman could have a Superwoman and Supergirl, Batman could have a Batwoman and Bat-Girl. If Superman could be Superboy when he was younger, Batman could have been Batboy. 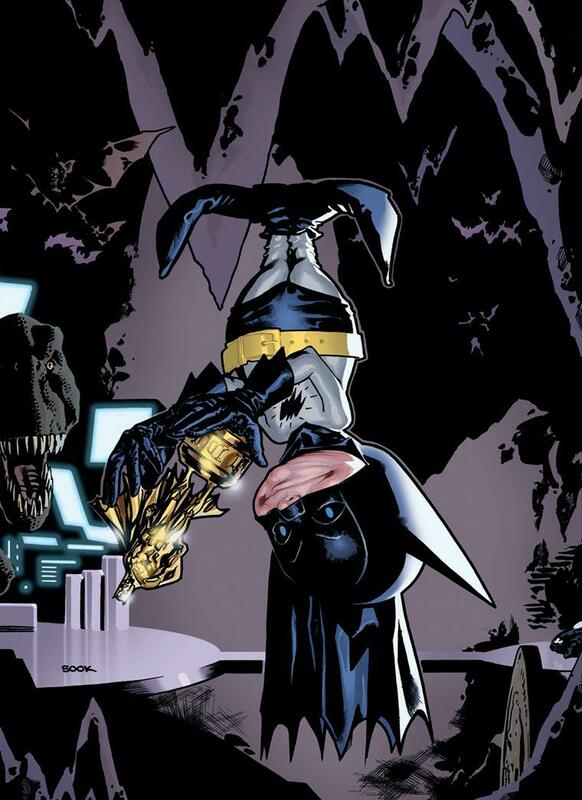 So if Superman had a reality altering imp in Mr. Mxyzptlk, then Batman could have Bat-Mite. Whereas Mxyzptlk delighted in troubling Superman, Bat-Mite was actually Batman’s biggest fan who wanted to turn the Dynamic Duo into a Terrific Trio. However when the imp (or elf, as he was called) consistently caused more problems than he solved, Batman actively sought trying to rid himself of his new ally. In animation, Bat-Mite spawned several supporting imps beginning with Zarbor, an imp in The New Adventures of Batman that tried to steal Earth’s nuclear power plants. In the Teen Titans cartoon, Robin gained his own imp in Larry, the Teen Wonder’s biggest fan. When the Joker gained Bat-Mite’s powers in Batman: The Brave and the Bold, he created his own imp fan in Joker-Mite. Superman and Batman’s imp problems proliferated through the many of the Justice League’s membership. Whereas Superman was Superboy and Superbaby and Batman was Batboy and Bat-Baby, Wonder Woman was Wonder Girl and Wonder Tot. 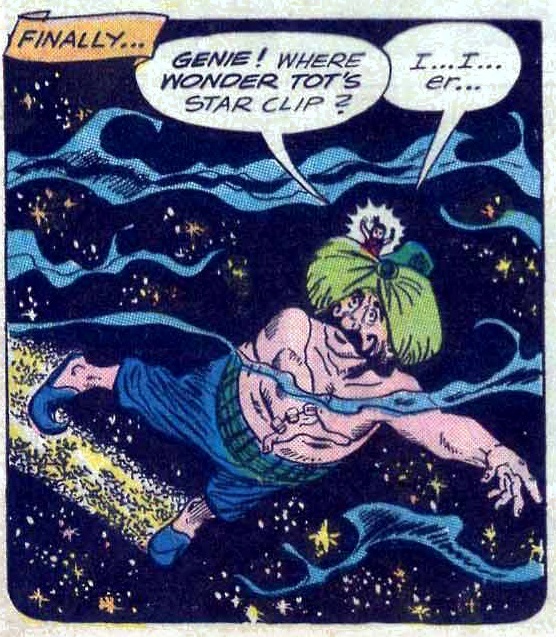 In her capacity as the latter, Wonder Tot befriended a genie named Genro (but whom she called “Mr. Genie”). While Superman and Batman wanted to be free of their reality-altering imps, Wonder Tot welcomed Mr. Genie as a good friend she frequently went on adventures alongside. In the pages of DC Super Friends, based on the Fisher-Price Imaginext toyline, a league of magical imps instead saw Wonder Woman represented by Shaggy, who alongside with Hoppy and Woggle were a trio of leprechauns that befriended the Amazonian princess. Among that league of imps was a Guardian of the Universe for Green Lantern but a more accurate representative may have been Myrwhydden. A magic imp imprisoned by Green Lantern Abin Sur inside his power ring, Myrwhydden troubled Hal Jordan who had inherited Sur’s ring. The other members of the league of imps were Qwsp and Mopee. 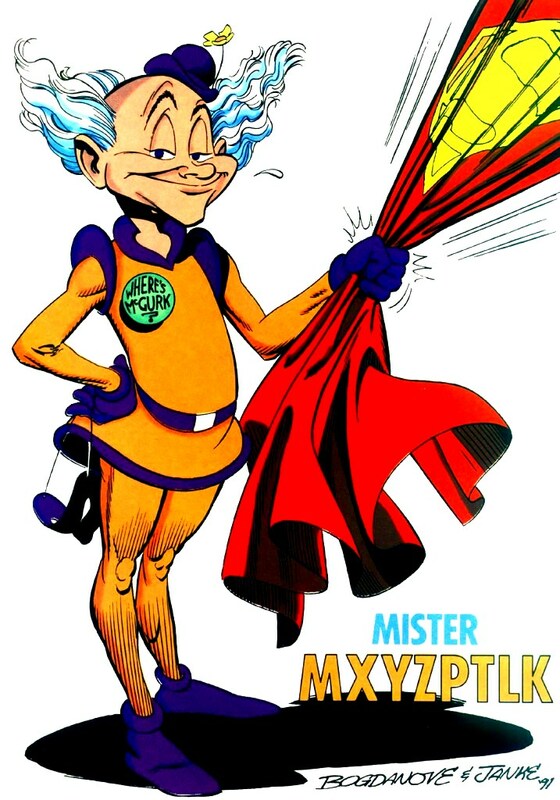 Mentioned earlier, the popularity of Mr. Mxyzptlk ignited similar characters across DC’s myriad of titles. Aquaman acquired his own such character in 1962 with Qwsp. A water sprite, Qwsp assumed a similar role as Bat-Mite for Aquaman and Aqualad. 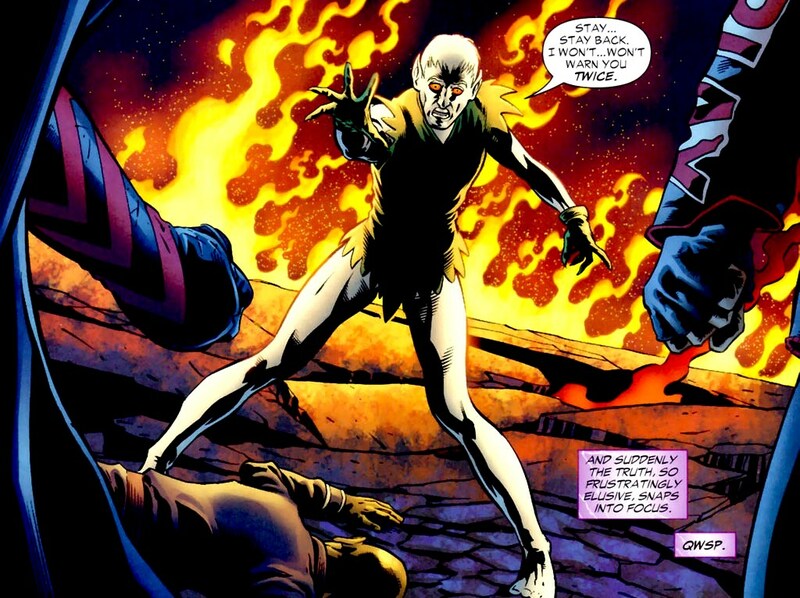 However, in the pages of Grant Morrison’s JLA, Qwsp was re-imagined as a malevolent being which, within the same storyline, revealed he was a Fifth Dimension imp as was Johnny Thunder’s thunderbolt genie Yz, his son Shocko, and Lkz (who merged with Yz to become Ylzkz). Johnny Thunder was paid homage by the character Jonni Thunder, but her thunderbolt counterpart was an evil alien named Mzzttexxal (who, alongside its mate Zzlrrrzzzm, wanted to conquer Earth). Mopee rounded out DC Super Friends‘ league of imps who was part of a retcon (retroactive continuity) of the Flash Barry Allen’s origin. Therein, Heavenly Help-Mate Mopee alleged he was the one responsible for the lightning bolt that gave him his powers but that was thereafter refuted. Superman, Batman, Wonder Woman, Green Lantern, Aquaman, and Flash were not the only Justice League founders that had imp issues. 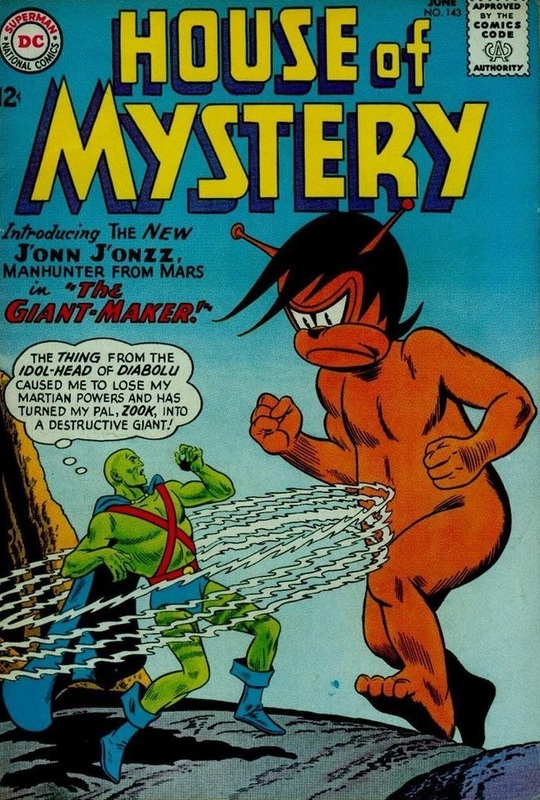 Finishing out the original seven founders of the Justice League of America, the Manhunter from Mars had to contend with Zook. A combination of the animal companion phenomenon that spawned Krypto, Ace, Jumpa, and Topo along with the imp craze, Zook was an imp animal from another dimension that followed R’ell, an alien that came to Earth to hunt down criminals from his dimension. Trapped on Earth in the wake of this conflict, Martian Manhunter adopted Zook as his pet. Green Arrow and the Atom also acquired magical allies leading up to Zook’s debut. 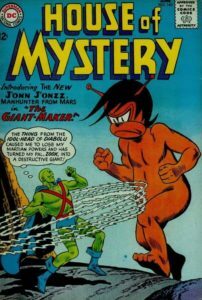 For the former, as Green Arrow often borrowed from Batman’s mythology, Xeen Arrow was something of an amalgamation of Bat-Mite with the Batman of Zur-En-Arrh as an alien lawman whose appearance bears a strong resemblance to Green Arrow (though, unlike Bat-Mite who resembles a small, doughy Batman, Xeen Arrow is massive in height and impossibly thin). As for the Atom, when the hero initially tangled with Jason Woodrue (who later became the Floronic Man, one of his greatest foes), he befriended Maya, Queen of the Dryads. Woodrue was from the same dimension as the Dryads who tried to conquer the Earth. When Captain Marvel transitioned to DC Comics, he too gained his own imp foe in Zazzo who used a helmet to steal the powers of Shazam to become Zazzo-Plus. DC Comics was not the only source of magical imps, though they may have inspired others. 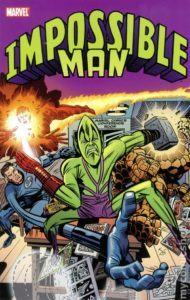 Stan Lee and Jack Kirby created Impossible Man, a shapeshifting alien who troubled the Fantastic Four in much the same way Mr. Mxyzptlk bothered Superman. In fact, decades later, creator Jerry Ordway implied Impossible Man and Mr. Mxyzptlk may in fact be one and the same in the pages of Superman. Around the time Impossible Man emerged to bother the Fantastic Four, the Great Gazoo became a reoccurring character on The Flintstones as a diminutive alien being of immense power essentially under the control of Fred Flintstone and Barney Rubble but who tended to cause more trouble than helped. 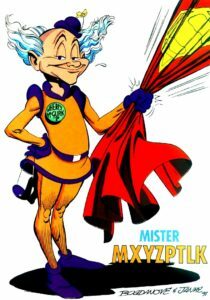 Several parodies of Mr. Mxyzptlk have permeated pop culture, including Super-Folks‘ Pxyzsyzygy, Star Trek‘s Q, Teenage Mutant Ninja Turtles‘ Mister Ogg, Sonic the Hedgehog‘s Verti-Cal and Horizont-Al, Gargoyles‘ Puck (with obvious allusions to Shakespeare’s character and assorted other trickster beings), Supreme‘s Szasz, and SuperMansion‘s Mister Skibumpers. This entry was posted in Comics and tagged DC Comics, Jerry Whitworth. Bookmark the permalink.